On Tuesday the Banff Mountain Film Festival was here in Boulder and they showed about six short documentaries. Lots of great shots of climbing, skiing, and snowboarding. My favorite was a documentary about three BASE jumpers who travel to central China to BASE jump into the Heavenly Pit. Thursday after work I packed up The Blue Machine and drove 3.5 hours to Steamboat Springs. Like last year, I stopped somewhere along I-40 deep into the remote mountains to star gaze. The night was calm and clear and the sky just looks so awesome when you can actually see thousands of stars and the dusty trails in the galaxy. Friday morning it was snowing, windy, and cold. I was at the Steamboat Springs Gondola before it was open and got to make some nice fresh tracks. However, it was just brutally cold so I eventually had to go inside to warm up every other run. So the morning was cold and mid day was a bit icy because it was warm on Wednesday so the layer underneath the powder was rock hard ice. 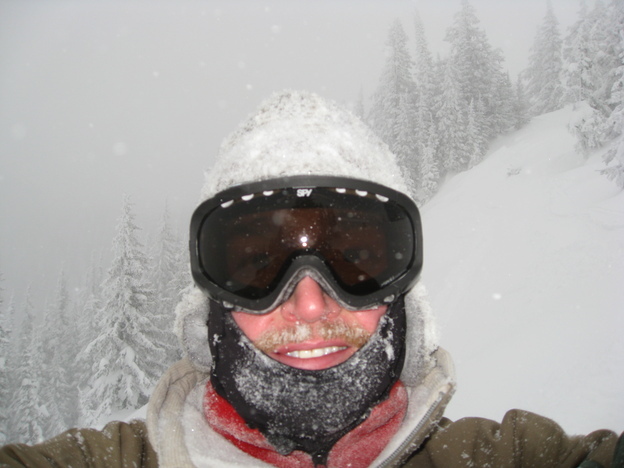 However, I did manage to find a few runs with good snow at the end of the day. I met up with a group of other Boulderites who had rented a condo for the weekend so I stayed with them Friday night. We had a nice meal and enjoyed hanging out. Saturday it was sunny, clear, calm, and delightful. We all skied/boarded together all day. It was nice to have such a big group (nine all together) and for them all to be expert skiers. We did a few hike-to runs, lots of trees, and a few journeys out of bounds. It was a blast. Sadly, I forgot my new snow pants at home, which prompted my companions to sing "He's a Jeans Skier" to the tune of "Dream Weaver" and inquire why I wasn't wearing an NFL jacket. There are more photos here and a video here. Today I'm looking forward to some much-needed yoga and saxophone and then next week work is going to get busy for a while. Previous page Vasquez Ridge lies behind me. Bloody, unconscious - vanquished. Next page Now with real mountains!